Not everyone we knew got it though. Why spend so much on a small box with few practical applications aside from typing without white out? But my old man was convinced that this was THE machine to take us into a new age, whatever that might be. I grew up in Scottsdale, Arizona — perfect weather nine months of the year, blistering hot for three. I spent many summer hours of my childhood in front of the SE's glowing screen battling 8-bit galactic dingbats, languishing of dysentery on the Oregon Trail, and of course learning to type at ever faster words per minute. Then one day, my dad came home with another smaller box. After an afternoon of adjusting settings in his office he invited me in. The new small box sat tethered to the SE with a row of emerald lights blinking on and off as a series of whirrs, chirps and beeps connected us to the the world wide web. The little machine reached out to patch me into an expanse of information and people well beyond the sheltered expectations of my suburban upbringing. In those infant years of the consumer internet I listened with Pavlovian anticipation to those dial-up sounds. The rest of the story is one familiar to billions of people – rapid development of the web, social media and mobile technology leading to the current state of hyper-connection. The Mac SE was the bridge for me between paradigms. I consider myself and others who experienced this sea change in information technology lucky. Lucky that we encountered the last years of pre-connectivity outside of irony or nostalgia, and that we took those early steps towards each other across the digital divide. We too are bridges. It is with this in mind that I run a contemporary art gallery — one that carries on the tradition of physical experience: walking around a sculpture, watching light shift across a painted surface, standing amidst an artist's vision allowing their world to envelope you. At the same time, the internet IS the medium of now and its power and ubiquity have opened up entirely new modes of experience visually, and socially. 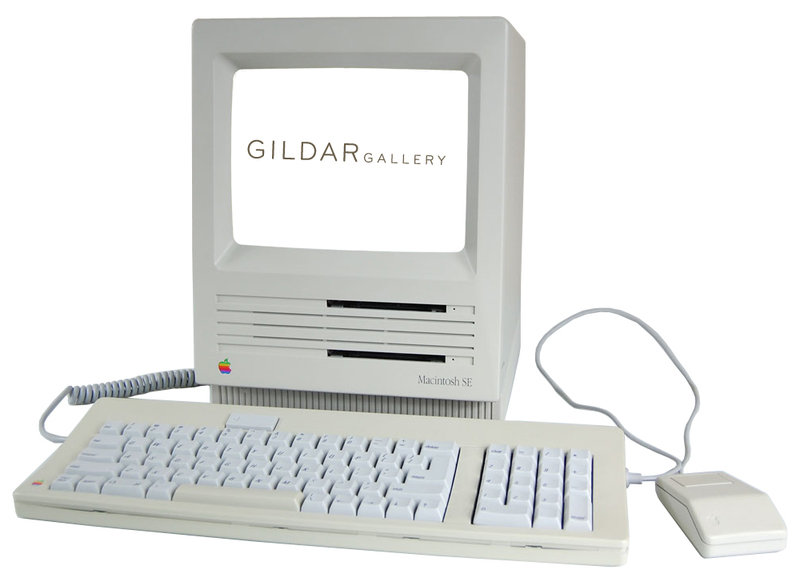 While Gildar Gallery has thrived in Denver for the last three years with a discrete storefront and an equally minimalist approach to its online presence, the time has come to upgrade. As we approach a new year, I am excited to share a website that opens the gallery's artists, exhibitions and inventory to that vast expanse of viewers and collectors beyond those who can regularly walk through the front door. It is my hope that this updated portal serves as an extension of the physical gallery. Whatever small box you use to find us online – be it your phone, tablet or computer – you can expect to experience in all of these platforms a contemporary program dedicated to art that reaches beyond expectations into the next age, whatever it may be.